Make America Drumf Again, John Oliver asked viewers on Sunday on his HBO show Last Week Tonight. The Daily Show With John Stewart alum scored a social media hit, inspiring twitter to send #MakeAmericaDrumfAgain trending on Monday. 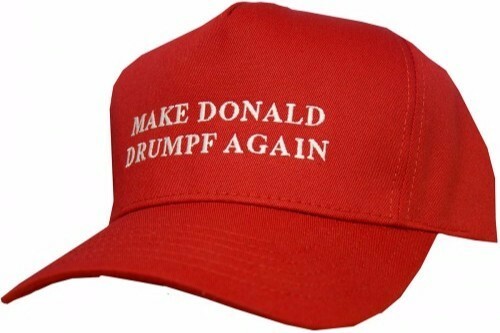 Make America Drumf Again combines Trump’s campaign slogan, Make America Great Again, with his European ancestors reported family name, Drumf. In the Last Week Tonight episode, Oliver called out Trump for falsely claiming that Stewart had changed his family name. Elements of the Last Week Tonight episode was quickly grafted into meme form. Oliver’s jokes were quoted, such as one where he compares Trump’s concern for facts to a leemer’s concern with the vacant seat on the Supreme Court. Users pushed the meme further by photoshopping existing Trump properties to display the name “Drumf.” A chrome app was quickly devised to automatically display Drumf instead of Trump on news websites and even Twitter itself. The humor got crowd sourced. Elements of the show were reproduced. Fans thought that the joke was just a joke... but the joke is real. Wait, this is real? Wow. In New Zealand, a teach created a Kiwi flag with Trump. Then someone suggested it needed lasers, so she added them. One teacher took the opportunity to compare Trump's non-answers to a poorly written book report.